The sun did shine yesterday, I went with Mr Uphilldowndale and Spud the dog* to see the Beyond Limits a ‘selling exhibition’ of contemporary sculpture in the grounds of Chatsworth house, it was luck rather than forethought that meant we turned up on the sunniest day for weeks. 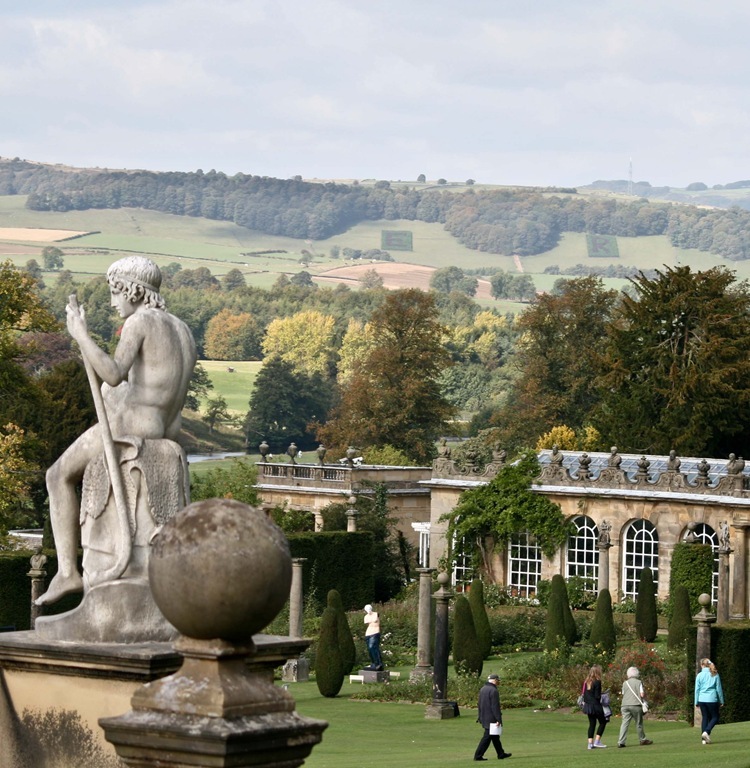 Chatsworth House has a long history of artistically punctuating it stunning gardens and vistas with works of art. So I’ve a heap of photos to share, it will probably take me all week. 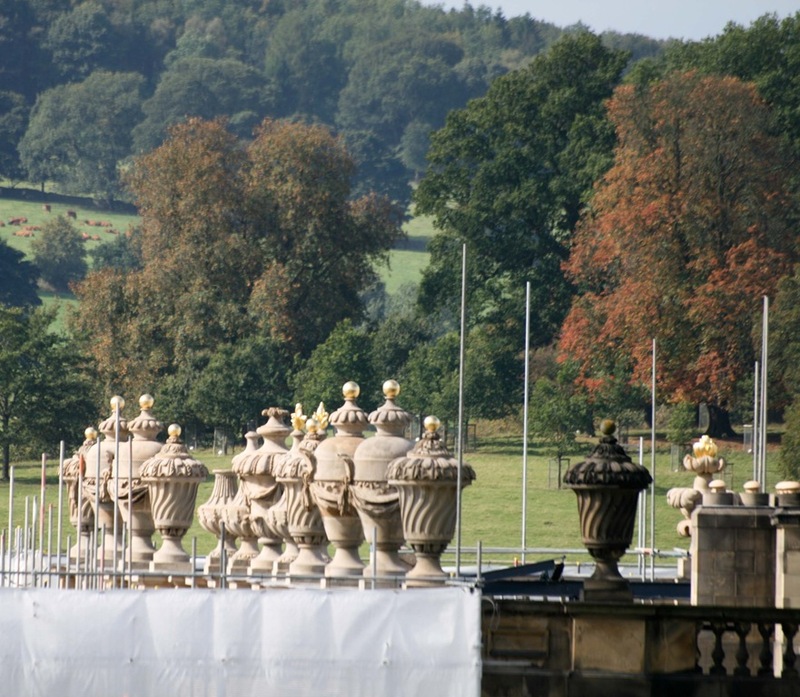 Readers with tenacity will remember I’ve been to Chatsworth before, a couple of years ago. 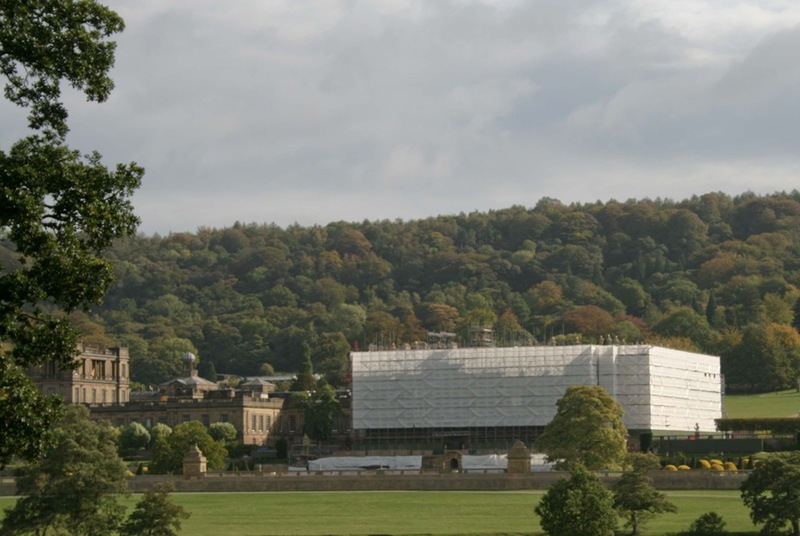 Chatsworth house itself is swathed in plastic whilst it has a bit of a wash and brush up. 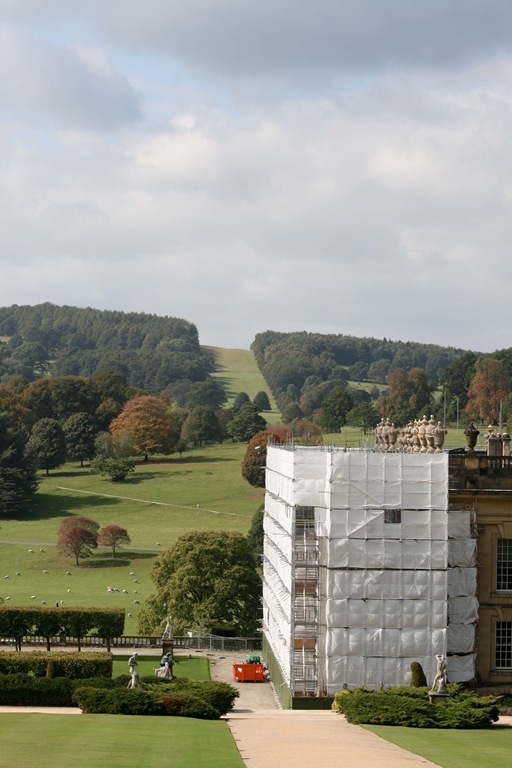 It looks like a big job and after having had our house roof redone last year, a job and a bill the Duke and Duchess of Devonshire are welcome to! and here; note the two blocks of green, just below the band of trees on the skyline. 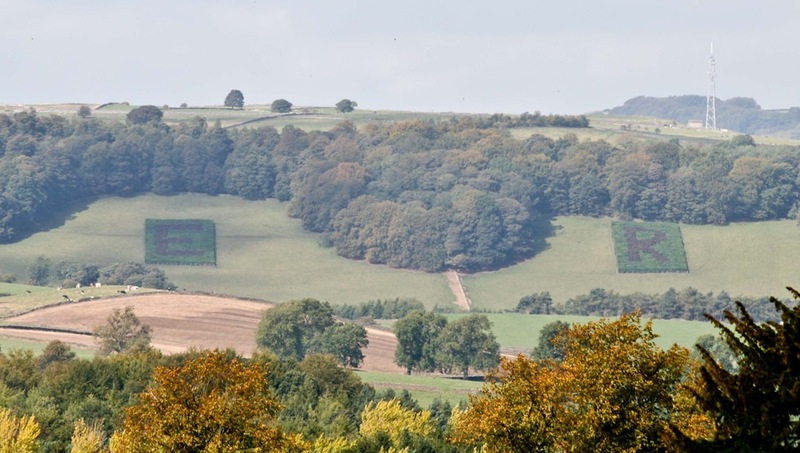 Visibility wasn’t the clearest, but perhaps you can make out the letters ER within the block of trees? The trees were planted to mark Queen Elizabeth’s II coronation a grand gesture indeed. Categories: Art, Away Days, Derbyshire, Dogs, Garden, History, Landscape, Peak District National Park, Spud, Thoughts | Permalink. I believe this must be a lovely place – even in more bad weather. I’m glad you have many more photos from there – and maybe of the art and gardens too?! We have the art and we have the gardens, coming up all next week! 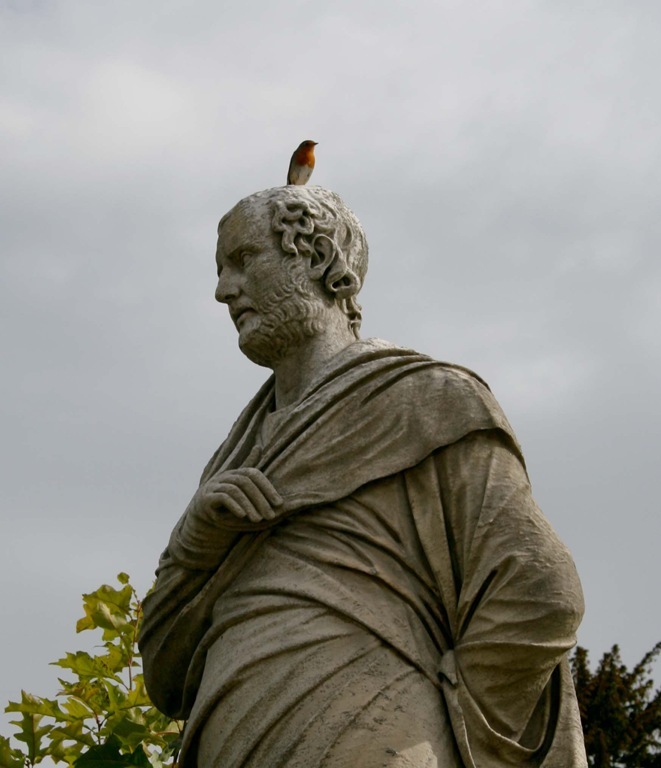 I love the photo of the statue with the bird surveying its surroundings from such a fine vantage point. Really a noticeable difference once the urns are cleaned! Looks like you had a super visit, good exploration and a fine time! I certainly do remember the last time you went to Chatsworth, because it prompted me and my family to do the same. That makes me a ‘reader with tenacity’, a label I am highly delighted to wear. However, last time we went, my son was in a wheelchair recovering from a knee operation, and actually this time, if we’d gone, he would have been in one again, following a further (fourth) operation. So really it is he who has the tenacity.